In the displacement category, the Grand Sturdy 530 AC Wheelhouse has been nominated for European Powerboat of the Year 2016. This award is based on the opinions of leading international boating journalists from Germany, Italy, Norway, Switzerland, the Netherlands, France and Austria, who nominate products in various categories. They assess on the basis of quality, product innovation, price/quality relationship, sailing characteristics and construction. The award will be presented during the opening ceremony of Boot Düsseldorf on Saturday 23 January 2016. Through new insights, new developments and new techniques, we continue to improve our yachts. Sometimes small details in the interior or in the engine room, but sometimes complex innovations like the new stern section with the steps down to the swimming platform. 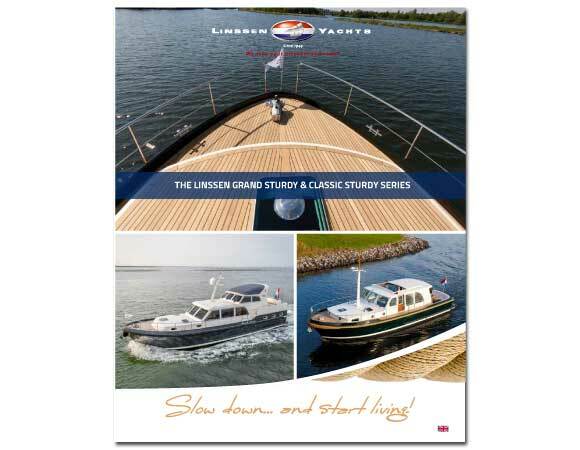 Along with input from our sales department, international representatives and several of our clients we have worked with ships designer Anne Elsinga, to combine the best layouts and the best sailing qualities to form the new Grand Sturdy series. A clear line of yachts: six lengths (290 , 350 , 410, 470 , 530 and 590) and in general four model variants ( AC, AC Variotop® , Sedan and Wheelhouse). Within the series are - depending on the model - the existing options as Longtop , Deck Bridge and a classic interior etc. still possible. Visit our website for more information and specifications per model. During the Hiswa te Water in Amsterdam, the first yacht in the new series was introduced: the Grand Sturdy 470 Sedan Wheelhouse. An incredibly spacious interior with first class craftsmanship and quality that you would expect from Linssen. On our website you will find more pictures and technical specifications for this yacht. Next weekend is the Grand Sturdy 470 Sedan Wheelhouse at the Southampton Boat Show in England (11 - 20 September). Than the 470 is ready for trials at the Linssen Cruising weekend (3 - 5 October) and she will be on display at Hanseboot (31 October - 8 November). Finally she will be on display in our showroom during the Linssen Yachts Boat Show (21 - 23 November). 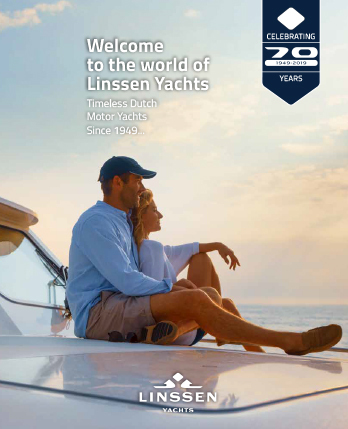 As a loyal Linssen fan, you probably made a note your agenda, but we mention it just the same: This years' Linssen Yachts Boat Show will be held from Saturday 21 until and inclusive of Monday 23 November. Besides the 470 Sedan Wheelhouse, on the Linssen Yachts Boat Show we will also show the Grand Sturdy 350 AC Variotop , the Grand Sturdy 410 AC and Classic Sturdy 410 Sedan Bridge Deck. More information about the exact programme will follow.